I avoided my normal review of “The Force Awakens” for a few reasons. I did not want to release any spoilers. That is no longer a consideration. I also wanted to take time to figure out why everyone seems to love it, while I found it completely disappointing. I have read quite a few discussions on the movie, and after some thoughtful work, I believe I understand why most like it while I hate it. I propose it has to do with a neural effect, rather than an unbiased consideration for the writing or film work. To clarify the effect, I must first delineate why I believe the movie is not the wonderful movie many folk believe it to be. Please bear with me on this. I know you enjoyed the movie – well, most of you seem to have. I know you have heard some of these complaints before. However, it is necessary to run quickly down the list. This is not a comprehensive list of complaints. It’s just a few to make a point. I will try to keep these short. It is a copy of “A New Hope”. That it is. Young outcast on a desert planet (apparently there are lots of these) joins Rebels, boards the Falcon, Falcon gets sucked inside something (garbage scow, space worm, whatever), has its cables chewed on by Mynoks or whatever, Falcon has to be whacked to start, plans are in the droid, X-wings and Tie Fighters fly though some trenches, hit the round spot on the big round Deathstar / Deathstar 2 / Starkiller, and boom. It is a repeat, right down to copied lines. Weak story writing, especially when you start with, “Episode VII” (we’ll be repeating Episode IV). Kylo Ren is a weak bad guy. What made IV tense was Darth Vader. Vader walked bold and with purpose. Vader did not make mistakes. Vader’s downfall (and growth) was a change of heart. Kylo Ren’s damaged mask suggested a hard and beaten ruffian. The scuffs on the mask turn out to be more kitsch when he reveals his lush quaff and pristine adolescent features. Kylo Ren makes mistakes and throws tantrums. He’s just a snot nosed emo. Not so scary. But VII had a strong female lead and a strong black lead. This assumes Leia was not a strong female character. Okay, she wasn’t the lead, but she is in the major triad. She snatched a blaster out of Han’s hands, blasted a hole in the wall of a cellblock and kicked Han, “Into the garbage chute, Flyboy.” Same for Finn. He is Lando 2.0 – the single black man in the galaxy. Lando saved Leia, Chewy, 3PO, 2R, and Han from Darth’s clutches. He’s no slouch. I guess I’m back to point 1. Just a rerun. IV, with all its faults, created some iconic moments. The day after it opened, everyone tried to describe the opening shot of the Cruiser going overhead, on, and on, and on, and on. Everyone could remember the sound lightsabers made. Everyone could recall the music of the Empire or the wispy flute of Leia or the French horn of Luke. All truly iconic moments that live on to this day. VII did not make any attempt at iconic, memorable moments. I could have accepted if they had tried and failed, but they didn’t even try. Can you remember Rey’s theme? Finn’s theme? Kylo’s theme? Can you remember any theme or sound effect or shot or line that was not lifted from IV? I can’t. Okay, my list could go on, but you get the drift. You’ve heard it all before, and you have always responded with, “Yeah, but…” This is evidence that will lead to my conclusion. People are automatically prepared to make excuses for the problems, to try to explain them away. For example, let’s look at the ‘it’s a copy’ observation. Some folk propose that it is a copy of IV because it is portraying some unending, cyclical battle between good and evil. Fine, if we are in a real tangible loop, the characters need to feel it, sense it. We don’t get that feeling. If we are in the endless struggle of good and evil, then the story needs to progress with that struggle, but it is clearly a repeat. Some have suggested it is a repeat because all stories are repeats. I get that, only seven original plots, only seven original characters. That does not mean you get a pass for not trying to be fresh. Certainly IV was, why not VII? The point is these are all excuses for clearly lazy writing and direction. But why are people so willing to make these excuses? Why are people so determined to call “The Force Awakens” great, when in fact it as poorly done as placing a communications plug into a power outlet? Three things: Time, Marketing, and Cognitive Dissonance. Time: Thirty-eight years have passed since IV opened. It changed the world. All the iconic things mentioned earlier still rock the world today. Even youngsters that never saw the original know how a lightsaber battle sounds. 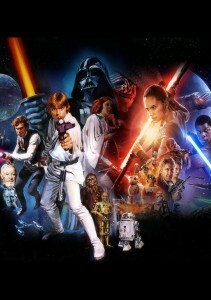 Over the years, there has been a constant discussion about how great “Star Wars” was, and is. People may have poo-pooed episodes 1, 2, and 3, but they still hung onto the greatness of “Star Wars”. If you take Jar-Jar and the Senate debate out of 1-3, they were still powerful, and offered memorable saber battles, amazing futuristic cities, and gut wrenching revelations. Maybe the pod race was a redo of the trench scene, or the forest bike scene, but it was different too. It was not the same ships doing the same moves and crashing in the same way. Did you know Anakin killed a bunch of children? I didn’t, and it made me ill.
Marketing: IV did not have any advanced marketing. The toys and marketing attachments came after its fame. VII had tons of lead marketing, whipping up those old desires for great “Star Wars”. The Marketing played with item 1 – Time. It counted on it. It counted on parents telling their kids how great “Star Wars” was and is. Marketing spent a half-year or more telling you that it would be great. That it would send you back to those wonderful feelings of yesteryear. Cognitive Dissonance: It is a psychological fact. It is easier for a belief to override a single contradictory thought than it is for a single thought to alter a belief. A belief involves a large network – the neural network of your brain. You have collected a lot of ideas and thoughts that support your belief, be it a religion, a philosophy, ideology, or your feeling about a movie. If a contradictory idea comes along, even if the idea is completely founded in logic or fact, it is harder for you to change your entire belief, to rewrite the entire network, than it is for you to find a way to discredit the contradictory idea. We all do it all the time. It is called, ‘making an excuse’. You MAKE it. You fabricate it so you can hang on to your primary belief. So there you have it. “The Force Awakens” could be total garbage. In my opinion, it is darn close to that. But even if it were garbage, most people would call it good because they wanted it to be good beforehand. They believed it would be good. They needed it to be good. They were told “Star Wars” is great. Their parents, their friends, their TV, have told them that. Their Internet, their toy dealers and grocery stores all told them VII would be great. They have been told J. J. Abrams is great. “Star Wars” by J. J., oh it has to be awesome. Since you believed it had to be awesome, you cannot accept where it is not. You find excuses for it being a copy. You find ways to justify it, ignoring that the same things had already been done. You disregard the weak spots, the poor score, the lack of new sound effects or camera angles and the stolen lines because you believed beforehand that it could not have any weak spots. You walked in thinking, “Any ‘Star Wars’ by J. J. is better than no Star Wars”. I find this to be sad. What does this mean for the future of moviemaking? Can all future scripts be copies, music and sound effects canned, shots mimicked, and characters weak, for “Star Wars” or any other movie? Is there no need to be fresh, provided producers can pre-plant in your head that it will be great anyway? If Episode VIII opens on a frozen planet, I may just walk out of the theater. This entry was posted in Life, Movie Reviews and tagged Movie, Sci-Fi, Star Wars. Bookmark the permalink. After thinking about it for a couple of days, I realized it’s fanfic with big-budget SFX and big-budget names. So much stuff is thrown into the mix, but not allowed to blend properly, that it just looks like a hodge-podge. And so many inconsistencies — Han and Chewie have been partners for *how* many years, and this is the first time Han has fired Chewie’s bowcaster? Kylo Ren is so strong in the force that he can stop blaster bolts and mind-control people into inaction, but is so unskilled that two – not one but TWO – people, totally untrained, can match him in a duel with light-sabers — the mind boggles. In IV, we have an iconic line: “I felt a shudder in the force, as if a billion souls cried out and were suddenly silenced.” The Starkiller takes out an entire solar system, and not a single mention about the lives – through the force or otherwise. Luke was driven to the Rebels because he saw the charred bones of his aunt and uncle. We understand his anger. Rey seems merely swept up by Finn. She has no reason to be on either side. Snoke reminded me immediately of Gollum. Okay, he is portrayed by Sirkus, but Snoke is 100% digital – he could look like anything. Instead, suddenly Gollum is in the middle of Star Wars. Kylo Ren – omg. When we first see him, he freezes a blaster bolt in space, shot from hiding. He holds it in space for a lengthy conversation, and releases it when he feels like it. Yet he gets shot by a blaster bolt, and his answer is to punch the wound, several times. Not once, but twice. You don’t punch open wounds. Sore muscles or cranky joints, sure. Open wounds – stupid. That’s just another tantrum, not the malice of a person in control of the Dark Side. Don’t get me started on the bad science. Okay, Star Wars is not Star Trek. There have always been wizards and magic, but there was some small sense of real. That’s all out the window now.